The ALEXANDER HAMILTON (SSBN-617) was laid down on 26 June 1961 at Groton, Conn., by the Electric Boat Division, General Dynamics Corp.; launched on 18 August 1962 (A news article at the time noted that the USS Alexander Hamilton was the 13th nuclear powered submarine built at EB); sponsored by Mrs. Valentine Hollingsworth, Jr., the great-great-great granddaughter of Alexander Hamilton, and commissioned on 27 June 1963, Comdr. Norman B. Bessac (Blue Crew) and Comdr. Benjamin F. Sherman, Jr., (Gold Crew) in command. Between 28 June and 18 October, ALEXANDER HAMILTON carried out two shakedown cruises-one for her Blue crew and a second for her Gold. Following those operations, she conducted post-shakedown availability. After trials early in 1964, she departed the east coast on 16 March to deploy to Rota, Spain, her base of operations. She conducted deterrent patrols out of that port for the remainder of the year as a unit of Submarine Squadron (SubRon) 16. In January 1965, the fleet ballistic missile submarine transferred to SubRon 14 and based at Holy Loch Scotland. Her cycle of patrols from there lasted until 2 June 1967 at which time she returned to the United States at Charleston S. C. Later that month, she moved north to New London, Conn. and thence into the Electric Boat yard on the 18th to begin her first overhaul and nuclear refueling. ALEXANDER HAMILTON completed the overhaul on 28 June 1968 and conducted post-overhaul trials, inspections, and shakedown training until early October. In November, she was deployed to Rota and conducted a deterrent patrol en route to her new base where she arrived on 30 December. For the next four years, the submarine operated from that Spanish port-again as a unit of SubRon 16. At the conclusion of her 31st deterrent patrol she returned to Charleston in November 1972 and, in January 1973 began her second refueling overhaul-combined with a conversion to carry Poseidon missiles-at the yard of the Newport News Shipbuilding & Dry Dock Co. The work on those two modifications lasted for over two years. The submarine carried out shakedown in April of 1975 and devoted the remainder of the year to training and various post overhaul trials. She conducted deterrent patrols 32 and 33 in the early part of 1976. ALEXANDER HAMILTON concluded the latter patrol at Holy Loch, Scotland, in May 1976 and conducted her next three patrols from that base. While on patrol 36, the fleet ballistic missile submarine visited Port Canaveral, Fla., and New London, Conn., before concluding that patrol at Charleston, S.C., in March 1977. During March and April, she completed refit and conducted refresher training. In July, she departed Charleston for another deterrent patrol which ended with her arrival at Holy Loch in September. From that Scottish base, the fleet ballistic missile submarine conducted deterrent patrols 39 and 40. She departed Holy Loch in May 1978 for patrol 41 and concluded it at Charleston in July. The warship remained there until August when she got underway for New London. She arrived at New London early in September and, after exchanging crews, embarked upon deterrent patrol 42 later that month. She ended that patrol at Holy Loch in October. Over the next year, she made four patrols from the base in Scotland. On 31 October 1979, ALEXANDER HAMILTON departed Holy Loch on her 46th deterrent patrol, ending it at Charleston on 7 December. Early in January 1980, the ballistic missile submarine departed Charleston on deterrent patrol 47 She concluded that patrol at Holy Loch on 17 March 1980 and; for the remainder of the year, operated from that base. ALEXANDER HAMILTON's deterrent patrols out of Holy Loch continued until 1986. At that time, she was to have been decommissioned in order to remove her from the fleet as a gesture of goodwill in accordance with the terms of the unratified SALT II strategic arms limitation treaty. Upon her arrival in Groton early in 1986, the ballistic missile submarine began preparations for deactivation. The grounding of NATHANAEL GREENE (SSBN-636), however, forced the Navy to change its plans. What had been a deactivation overhaul quickly became a four-week maintenance availability to get ALEXANDER HAMILTON ready for active service. In April, the warship sailed to Charleston, S.C. for further work conducted in the floating drydock ALAMOGORDO (ARDM-4). While at Charleston, she also served at sea occasionally as a training platform. In mid-June, the warship returned to Groton. During the summer of 1986, ALEXANDER HAMILTON participated in training cruises for Naval Academy and NROTC midshipmen. In August, she learned that her refueling overhaul would be conducted by the Puget Sound Naval Shipyard. The nuclear-powered ballistic missile submarine departed Groton on 1 October to begin the long voyage to Bremerton, Wash. Steaming by way of the Panama Canal, she arrived at her destination late in November. ALEXANDER HAMILTON formally began her refueling overhaul on 30 November and as of the beginning of 1987, was still at the Puget Sound Naval Shipyard. This is from the on-line DICTIONARY OF AMERICAN NAVAL FIGHTING SHIPS. Unfortunately, the information recorded stops at 1987. However, the HAMILTON operated into the 1990's and was decommissioned on 2/23/1993 and stricken from the naval roster on the same date. She was disposed of through the Submarine Recycling Program on 2/28/1994. In early 1991, ALEXANDER HAMILTON sailed out of Groton and made numerous port visits, some of them in the Caribbean, including St. Croix the birthplace of the ship's namesake, Mr. Alexander Hamilton. During this period she also stopped in Charleston and Ft. Lauderdale. During the last year of operations out of the Washington home port (Trident Squadron 17), the HAMILTON completed support service for TRE's (Tactical Readiness Exams) for several of the Trident Submarines stationed there. The boat and crew represented themselves well, even against the newer, more advanced submarines. This information is 1985 and after. In January 1985 the ALEXANDER HAMILTON received the prestigious 1985 Secretary of Defense Award for Maintenance Excellence. 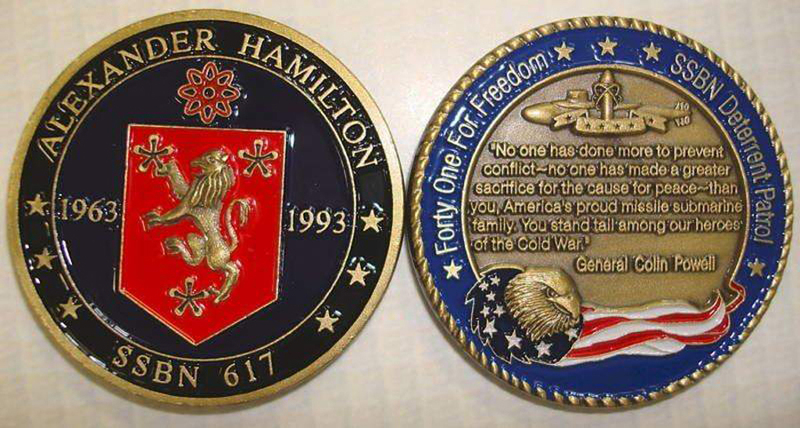 The honor was bestowed in light of ALEXANDER HAMILTON's sixty-ninth strategic deterrent patrol, THE MOST EVER FOR AN SSBN. In May 1986 in support of the Strategic Arms Limitation Treaty (SALT II), plans were made to decommission the ALEXANDER HAMILTON. However, as a result of the grounding of USS NATHANIEL GREEN (SSBN 636) the decision was changed to overhaul rather than decommission the ship. In November 1986, ALEXANDER HAMILTON was transferred to Puget Sound Naval Shipyard, Bremerton, Washington for refueling and overhaul. In December 1988, the ship returned to Squadron FOURTEEN and completed strategic deterrent patrols seventy through seventy-three. ALEXANDER HAMILTON pulled into Charleston, South Carolina in June 1991 to offload missiles in preparation for a return to the Pacific for decommissioning. August 23, 1991 marked the official transfer to Submarine Group NINE, Naval Submarine Base Bangor. April 28, 1992 marked the 1000th dive for the ALEXANDER HAMILTON; THE MOST DIVES EVER RECORDED FOR AND SSBN. The final total of 1,002 dives was achieved on May 1, 1992. USS ALEXANDER HAMILTON (SSBN 617) (was) deactivated on August 18, 1992, EXACTLY thirty years after launching. of the final years of this fine ship please get in touch with me.